Catalans Dragons returned to winning ways as they inflicted a heavy defeat on out-of-form London Broncos. 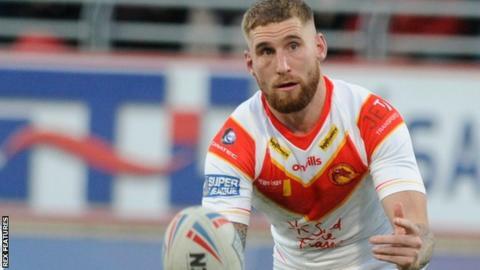 The visitors from Perpignan ran in six tries in a dominant display in west London, including 18 points from full-back Sam Tomkins. Matt Whitley scored a brace while Lewis Tierney, Greg Bird and Arthur Romano all dotted down for Dragons. Broncos' solitary try came from Mark Ioane as they fell to a fourth successive league defeat. The hosts will also be concerned over a serious-looking apparent head injury to half back Jordan Abdull, who was taken to hospital following a first-half collision with Sam Moa. It was unclear what caused Abdull to require lengthy treatment on the pitch. But he was stretchered off into an ambulance and both Moa and Broncos' former Catalans forward Eloi Pelissier were sin-binned in the aftermath. Broncos were unfortunate not to be rewarded with more points for their efforts in the first half, when Jay Pitts had an early try disallowed. Rhys Williams and Matt Gee were also held up in the Dragons' in-goal area before the visitors took charge. Catalans now host Castleford on Monday. when the Broncos must visit Huddersfield. "We're not scoring a lot of points and Super League defences are very good, which is something we're adapting to as newcomers into the league. "We're probably not adapting on the run. We can't just keep sticking with the same thing when defences are reading it. "But we seem to be creating some good chances and we put down some good defence of our own. "It's those opportunities where maybe the final pass doesn't go to the right man, but it's something we're working on and working hard on." "On Monday, London aren't going to be at their best. We aren't going to be at our best. Is any team going to be right at their best after playing Thursday or Friday? It's a war of attrition. We don't hide from it. "I'm not complaining about playing on Monday whatsoever. It is what it is and everyone has their recovery strategies in place, and it's interesting from that perspective, but if you want to see the very best rugby league, it isn't going to happen on Monday. "There's a neglect of player welfare. I don't think people understand how hard this game is. It's wrong what we're doing to them. At the minute, we have to do it because the game needs so many games over Easter. "In my opinion, once we can generate that much income into the game so that we can afford to reduce the number of games, and we don't have to play each other so many times; then we've got a successful model and we're able to ensure that the players can compete at their very best week in, week out." London Broncos: Walker; Ogden, Morgan, Kear, Williams; Abdull, Smith; Battye, Pelissier, Butler, Pitts, Gee, Yates. Interchanges: Ioane, Cunningham, Richards, Adebiyi. Catalans Dragons: Gigot; Romano, Langi, Whitley, Tierney; Bird, Tomkins; Bousquet, Da Costa, Moa, Goudemand, Jullien, Casty. Interchanges: Edwards, Simon, Baitieri, Kasiano.